There are three autopilot settings: Autopilot Connect, Autopilot Margins, and Autopilot Launch. They are by default "on". To turn them on or off, go to the "contract settings" page and press "Save" to apply your changes to your offerings. You cannot turn off Autopilot Connect. 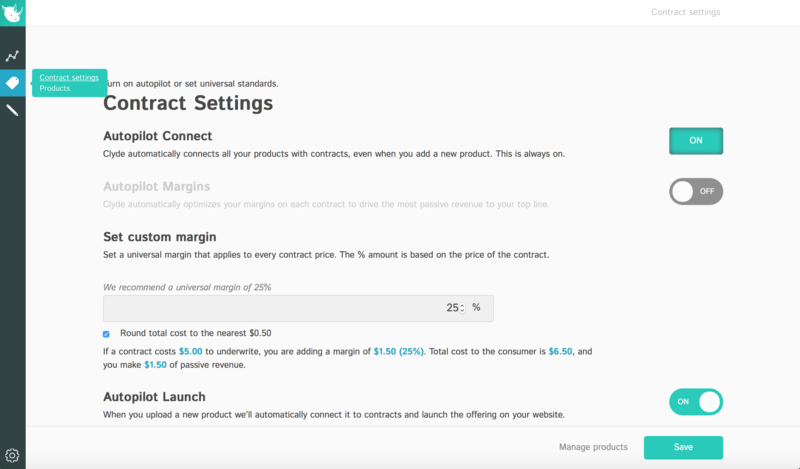 This will always be on to match your products to contracts, but you can use Autopilot Launch to control whether these contracts are automatically added to your store. Yes, you can turn off Autopilot Margins. You will be prompted to add a universal margin instead. Your universal margin will be applied to all contracts across your website. Yes, you can turn off Autopilot Launch. When off, Clyde will contact you to ask whether you want a new contract launched on your site for a new or updated product.